I found this in my travels. It’s a rare colour still from BUNNY LAKE IS MISSING. We finally get to see what Keir and Carol Lynley looked like in colour as oppose to black and white. I also wanted to let you know I’m in the process of getting some event images up in the gallery. I have to edit and tag them. So stay tuned. 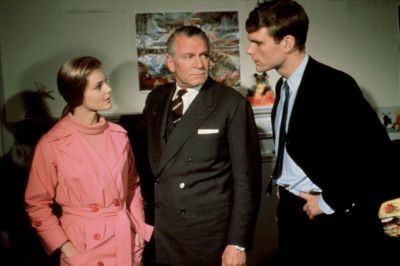 This entry was posted on Wednesday, August 28th, 2013 at 8:11 am	and is filed under Bunny Lake Is Missing, CHARACTERS, FILM, FILMS, KEIR DULLEA, Steven Lake. You can follow any responses to this entry through the RSS 2.0 feed. You can leave a response, or trackback from your own site. See the nice gifts I give you guys? I was shocked to find this one. I love how you describe Keir as Steven. So apropos. I think the part that will always scare the crap out of me is when Steven takes off his tie and begins wrapping it around his hands as a garotte. I cannot believe he played that scene so scarily. I loved though how Ann knew what to do with Steven to get him to ignore Bunny. The next part is when Steven is jumping up and down on the trampoline. Damn good acting from Keir and Carol.